Most Canadian Christians encounter the Week of Prayer for Christian Unity through an ecumenical service at their church. We might wonder, though: Are there other ways of celebrating the Week of Prayer? Can this ecumenical event be accessible to Christians who are unable to come to a church service? Rev. 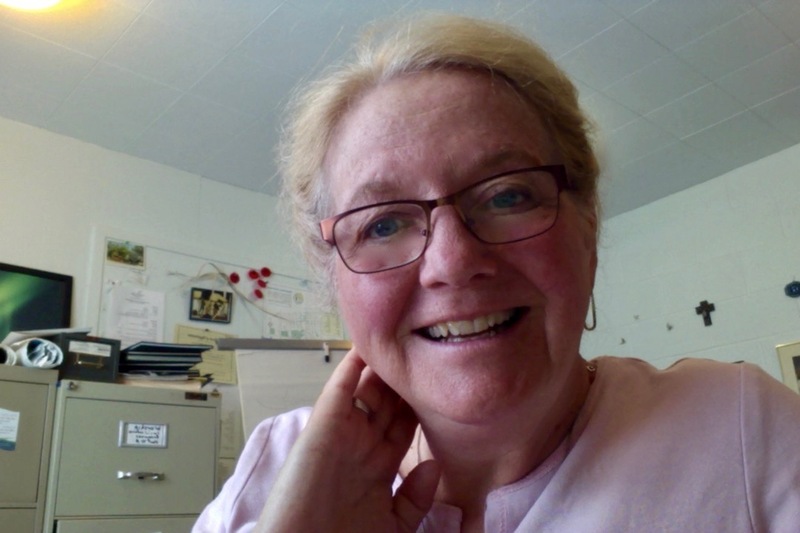 Marilyn Leuty, who ministers to the congregations of St. Paul's United Church in Assiniboia, SK, the Coronach United Church in Coronach, SK, and Wesley United Church in Rockglen, SK, has an answer to these questions. For the last few years, she has been using the Week of Prayer for Christian Unity materials in worship services at local seniors’ residences. We asked Marilyn to share her experiences with you. Perhaps her story will spark some ideas in your local context. Q: Why did you decide to bring the Week of Prayer for Christian Unity to seniors’ residences? ML: When I moved to Saskatchewan from Ontario about five years ago, I found a vibrant ‘grass-roots’ ecumenical environment. In many ways, this is a feature of the Saskatchewan immigrant experience. European settlers – who came from Eastern Orthodox countries, the Lutheran and Reformed traditions of Sweden and Norway, and from Roman Catholic countries – were not numerous and lived in a fairly isolated rural setting. Often, they simply did not have the option of ‘separating’ along traditional denominational lines, and worshipped together. They saw one another as neighbours, intermarried, went to one another’s weddings and funerals. In short, their circle was small yet wide; they had a lived, close familiarity with different Christian traditions, practicing ‘ecumenism’ without knowing this word. This historical experience of unity and diversity can be recognized in the seniors’ residences I serve. The residents live together and worship together. Even if they belonged to ‘denominational’ congregations or parishes before retiring, they find a new, joyful experience in crossing these borders – or, to put it better, in seeing ‘denominations’ as different expressions of Christianity rather than as barriers. All worship at our seniors’ residences is intentionally interdenominational, led by pastors from different churches who serve on rotation. So, the Week of Prayer was a natural fit. Q: You mention that you adapt the yearly WPCU materials to fit the needs of local seniors. Can you tell our readers more? If I am a pastor or a volunteer, and want to involve local seniors in the Week of Prayer for Christian Unity, what should I be aware of? ML: Most importantly, you should be aware of the needs and capacities of the people you serve and adapt the Week of Prayer materials accordingly. For example, if you don’t change any of the text, and if you include hymns or music in the WPCU service, it might run for an hour – hour and a half. This is too long for most seniors, so I usually shorten the service to about 20-30 minutes. You also need to think about who will lead the service. In some of the residences I visit, the reality is that I cannot involve the seniors in the worship because of various disabilities. Or, you might not have an opportunity to practice the service with the seniors beforehand. So, you might decide to do the whole service yourself, or bring some volunteers to lead prayers, sing, or do a particular symbolic action. This is a great opportunity to involve interested folks from different Christian churches in your area. Thinking through the words and music of the Week of Prayer service is also important. For example, I try to make the worship as familiar and simple as possible – so that the residents who are ‘non-verbal’ can participate. Since this is an ecumenical service, I try to find hymns that are common to people in most or many traditions, and incorporate elements that cut across denominations, such as the Lord’s Prayer. Don’t feel that you have to ‘stick’ to the main text of the yearly WPCU worship service. I often use parts of the ‘8 Days of Prayer’ resource – especially the short biblical reflections and the short daily prayers provided there – for a dedicated WPCU service in the seniors’ residences. Or you can incorporate short ‘bits’ of biblical reflections and daily prayers into several regular worship services – in January or during other months of the year. When you choose the music, it’s always good to think about the local context or ask what the seniors themselves would want. For example, you might find that Christmas carols are most appropriate – because they are well-known and shared across traditions. Or there might be some ‘non-ecclesial’ Christian music that’s useful (for example, country music songs). Don’t be afraid to ask for advice and to be inventive. You might not have anyone to help you with musical accompaniment. I’ve often used mp3 downloads of hymns and music (anything that could be found without copyright). You might also bring some CDs and a CD player to accompany the service if you don’t have singers or musicians. Whatever you decide to do, I find that simplicity and clarity are key when planning worship for seniors. Last but not least, you might have the challenge I don’t have in my context. In the senior residences I visit, people are familiar with interdenominational services and are receptive to the ecumenical ‘flavour’ of WPCU worship. If the denominational lines are more firmly drawn in your area, you might need to consult with the residences’ staff and explain what the Week of Prayer is, and why it is important to express various Christian traditions in the service. Also, you might want to have a conversation with the seniors about what it means to gather across denominational boundaries and to pray for Christian unity. Q: Do you do anything after the Week of Prayer worship service at the seniors’ residences? ML: Yes, I invite the seniors to ‘tea time’ after the service in some residences. This, again, would depend on the local context and on the residents’ health and abilities. You might have an opportunity for a conversation with the seniors during ‘tea time’ – this is a great time to share experiences and impressions, to have fellowship, and to ask for feedback. Q: What do the seniors bring to the Week of Prayer for Christian Unity? What can they take away from it? ML: Many seniors living in residences are ‘on-the-ground’ ecumenists who daily experience the reality, the challenges, and the gifts of Christian diversity and unity. If you invite volunteers from different churches in your area to help you prepare a WPCU service for the seniors, and to participate in it as worship leaders or musicians, they might learn a lot from the residents and translate these insights and gifts into the lives of their communities. For the seniors themselves, joining with one another – and with Christians around the world – in prayer for unity is a gift. If this story inspired you to organize a Week of Prayer for Christian Unity service or event for seniors in your area, and you would like to know more or have questions, please let us know. We’d also love to share photos, stories, impressions, or ideas from your local WPCU events or services on this website. Email us to share your experience!